I have been waiting weeks for my favorite moment in fall. It’s almost here! My ginkgo is turning golden and is getting ready to drop its leaves! It might not be an exciting prospect for some people but the fall leaf drop of Ginkgo biloba is something I find amazing and wonderful. Before I get into why, let me tell you about this fantastic tree. 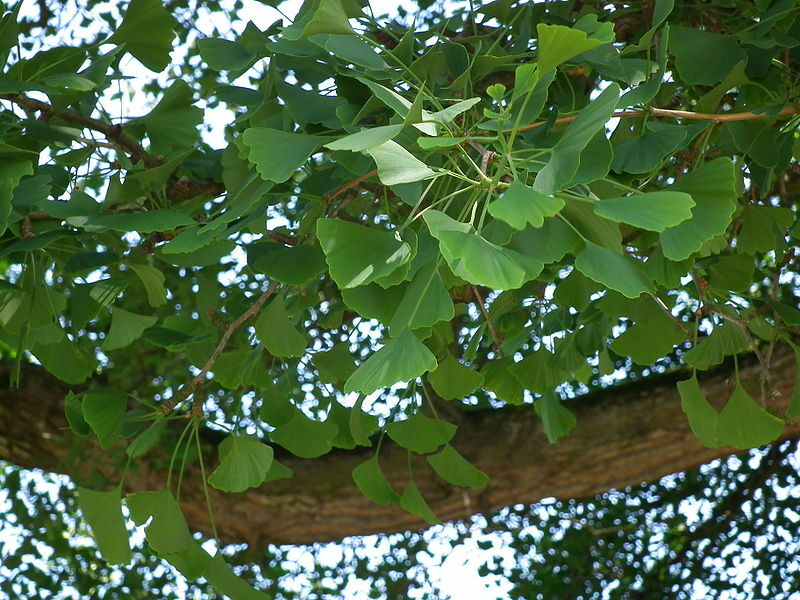 Also known as maidenhair tree, Ginkgo biloba has unusual leaves in that they do not have a branching network of veins; single veins run from the base of the leaf in a straight line to the edge. Ginkgo biloba is a living fossil—fossils of Ginkgo biloba date back 270 million years, predating even the dinosaurs. This tree is truly durable and long lasting. They make excellent street trees, tolerating restricted soil space and pollution. Several even managed to survive the detonation of the atomic bomb over Hiroshima, Japan! 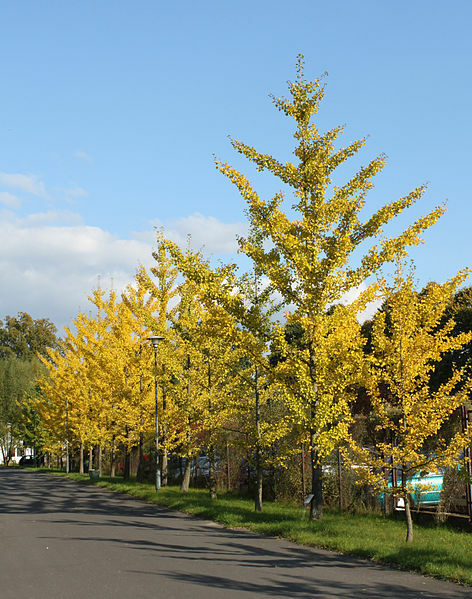 A row of ginkgo trees planted along a street demonstrates the difference in growth habits. Though ginkgo tree habits tend to vary between cultivars, they can grow anywhere from 50-100 feet high and 30-40 feet in diameter. When left to grow naturally, these trees will grow slowly, but growth can be accelerated with the help of fertilizer and watering. Young ginkgoes can often be very open and awkward-looking when left unpruned, and this is clearly visible with some street trees. Their habit, however, will improve with age as these young, long branches will become massive and reminiscent of old oaks over time. Ginkgoes can be male or female, and identification is easiest at this time of year. Your nose can tell you if a ginkgo is male or female before you even see it. The female typically produces an abundance of fruit with a bad odor. In fact, the University of Illinois has a female ginkgo tree near the center of campus where students frequently walk, and it is not uncommon to see people checking their shoes, thinking they “stepped in something.” This fruit frequently makes a mess on lawns, paths, and sidewalks. That is why males are usually preferred for landscapes. Yes, they are edible, but the fruits of the female ginkgo tree have a distinctive, unfriendly smell. Female trees are often single plantings, rather than a series of trees. In spite of the fruit odor, and beyond their ornamental value, some research suggests that the leaves can be used to improve memory and concentration. The leaves also increase the body’s production of norepinephrine, which can increase heart rate. The seeds of the female tree can also be used in cooking and are sometimes considered an aphrodisiac. If you are interested in picking the fruit, however, make sure to pick fallen fruit and wear gloves, because some people will have an allergic reaction from contact with the fleshy coating. 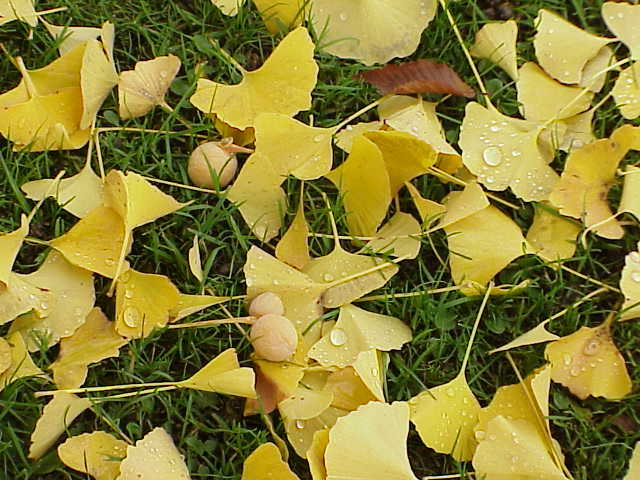 My favorite thing about ginkgoes, however, is their dramatic fall color and leaf drop. The leaves of ginkgo turn a beautiful golden yellow that rivals the fall color of birches. Beyond their fall color, the real drama happens after the first few golden leaves fall. After this, you can expect the rest to fall within the next 48-72 hours, carpeting the ground beneath it in golden yellow leaves. 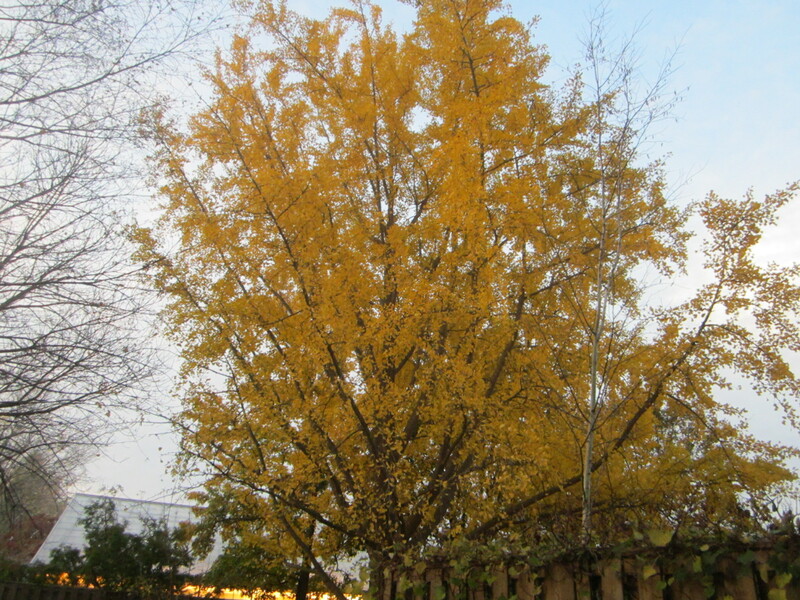 A ginkgo tree in full fall glory. Male trees bear catkins in early spring; female trees flower, but very inconspicuously. As part of our specialized collection, the Chicago Botanic Garden has 28 different varieties of Ginkgo biloba, all of which can be located via our website and GardenGuide plant finder app. I hope you can find your way to the Garden and check out all our wonderful ginkgoes!